Desjardins Groups is among Canada’s largest insurers, offering a diverse selection of life and living benefits products through their network of credit unions and brokers. Ideal for individuals, families, and businesses, Desjardins can help you create a plan that works within your budget to cover your needs. Vision Death Coverage 7, 10, 12, and 20 year terms Ages 0 to 75 Guaranteed premiums and coverage for term chosen. Renewable without a medical exam. Insured up to 5 people on one plan. Vision to Age 100 For life, or paid up in 10, 15, 20 years Ages 0 to 75 Guaranteed coverage for life and premiums for period chosen. Insure up to 5 people on one plan. 50+ Life Insurance For Life Ages 50 to 75 Lifetime coverage with no medical exam. Accidental death pays 5 times coverage up to age 85. Universal Life For life, or for a set period chosen Ages 0 to 75 Choice of daily or fixed interest wealth accumulation. Option to make withdrawals from your policy tax-free. GetWell To age 75 Ages 0 to 64 No medical exam required. Coverage up to $25,000 for cancer, heart disease, or infectious disease. Vision Critical Illness For life, or to age 75 Ages 0 to 65 Covers up to 33 critical conditions. Includes reimbursements for home care, as well as aid for psychological services. Vision Disability 5 year terms to age 65 Ages 18 to 60 Index your benefits to protect against inflation. Ideal for self-employed or tradespeople. 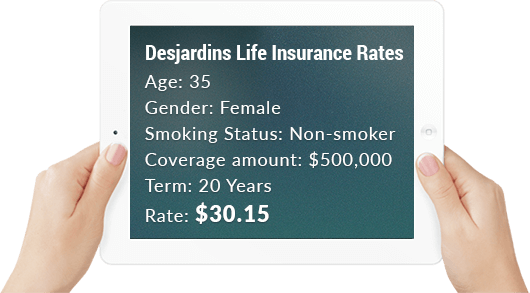 We are pleased to offer all life insurance products provided by Desjardins. For a quote on all available life insurance plans, please use our no-obligation quote provided on the right to explore your options and find the right fit for your needs.